UFW Stories: "What About The People?" I had long supported the UFW and Cesar Chavez, by holding fast during the grape boycotts & the lettuce boycotts of the 60s & the 70s. But now it was the 80s, and I had become immersed in environmental issues. So, I stopped at a restaurant on Sepulveda on the way to LAX and a man gets out of a very modest car with another man, and one of them looks a lot like Cesar Chavez. But, it couldn’t be him. No entourage, no security detail. Such a modest car. But, when he walked past my table, I saw that it was him. So, I waited till he ordered and was waiting for his meal and went over and I admired him, and how I helped from a distance many times over the years. He asked me what MY passion was, and I told him it was the environment. We talked about the kids who had gotten sick in McFarland, Earlimart & elsewhere. He was impressed that i knew some of them by name. Thus began an 8 year relationship that enabled me to work with this great man on pesticide issues, and eventually many other matters of social & environmental justice. 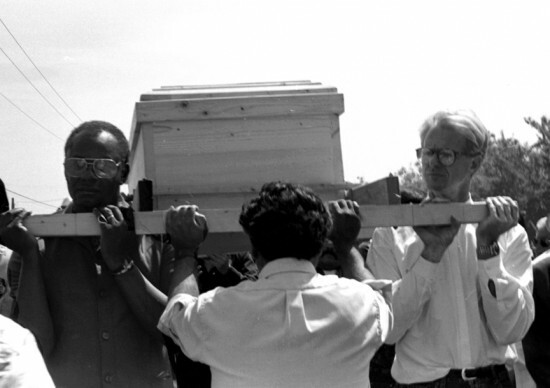 A relationship that continued till I had the sadness and the honor of carrying his coffin through the streets of Delano. Along with 50,000 others. I continue to work with my current hero and dear friend, Arturo Rodriguez on UFW matters, and will do so till I am carried through the streets. I will NEVER forget you Cesar.